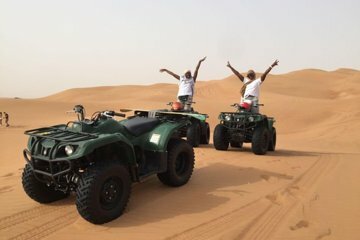 This is my second desert safari experience in Dubai. I believe that it was a short and painless experience.Although my team had small injuries due to them falling of the bikes in general the trip was rated by the team as great first and beginners experience. -the camel ride for myself was too short ,15 min? The providers personell were very friendly and helpful and the facilities were very good.